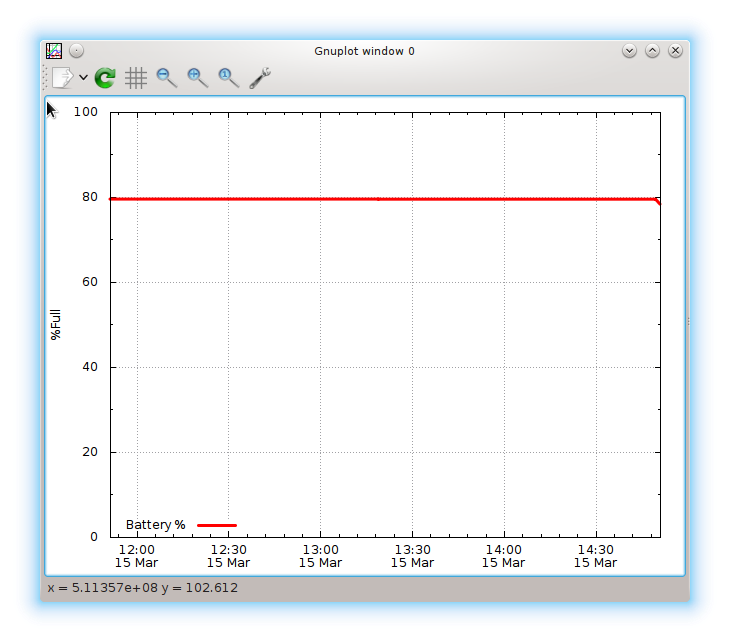 Since this morning, the battery-stats package in Debian include an extended collector that will collect the complete battery history for later processing and graphing. The original collector store the battery level as percentage of last full level, while the new collector also record battery vendor, model, serial number, design full level, last full level and current battery level. This make it possible to predict the lifetime of the battery as well as visualise the energy flow when the battery is charging or discharging. Or select the 'Battery Level Graph' from your application menu. I'm not quite happy with the way the data is visualised, at least when there are few data points. The graphs look a bit better with a few years of data. A while back one important feature I use in the battery stats collector broke in Debian. The scripts in /usr/lib/pm-utils/power.d/ were no longer executed. I suspect it happened when Jessie started using systemd, but I do not know. The issue is reported as bug #818649 against pm-utils. I managed to work around it by adding an udev rule to call the collector script every time the power connector is connected and disconnected. With this fix in place it was finally time to make a new release of the package, and get it into Debian. If you are interested in how your laptop battery is doing, please check out the battery-stats in Debian unstable, or rebuild it on Jessie to get it working on Debian stable. :) The upstream source is available from github. As always, patches are very welcome. Back in 2013 I proposed a way to make paper and PDF invoices easier to process electronically by adding a QR code with the key information about the invoice. I suggested using vCard field definition, to get some standard format for name and address, but any format would work. I did not do anything about the proposal, but hoped someone one day would make something like it. It would make it possible to efficiently send machine readable invoices directly between seller and buyer. The interpretation of the fields can be found in the format specification (revision 2 from june 2014). The format seem to have most of the information needed to handle accounting and payment of invoices, at least the fields I have needed so far here in Norway. I also asked if they planned to maintain the format in an independent standard organization to give others more confidence that they would participate in the standardization process on equal terms with Visma, but they had no immediate plans for this. Their plan was to work with banks to try to get more users of the format, and evaluate the way forward if the format proved to be popular. I hope they conclude that using an open standard organisation like IETF is the correct place to maintain such specification. Update 2016-03-20: Via Twitter I became aware of some comments about this blog post that had several useful links and references to similar systems. In the Czech republic, the Czech Banking Association standard #26, with short name SPAYD, uses QR codes with payment information. More information is available from the Wikipedia page on Short Payment Descriptor. And in Germany, there is a system named BezahlCode, (specification v1.8 2013-12-05 available as PDF), which uses QR codes with URL-like formatting using "bank:" as the URI schema/protocol to provide the payment information. 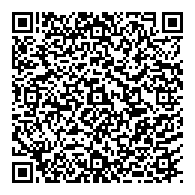 There is also the ZUGFeRD file format that perhaps could be transfered using QR codes, but I am not sure if it is done already. Last, in Bolivia there are reports that tax information since november 2014 need to be printed in QR format on invoices. I have not been able to track down a specification for this format, because of my limited language skill sets. Back in September, I blogged about the system I wrote to collect statistics about my laptop battery, and how it showed the decay and death of this battery (now replaced). I created a simple deb package to handle the collection and graphing, but did not want to upload it to Debian as there were already a battery-stats package in Debian that should do the same thing, and I did not see a point of uploading a competing package when battery-stats could be fixed instead. I reported a few bugs about its non-function, and hoped someone would step in and fix it. But no-one did. My plans for the future is to merge my old scripts into the battery-stats package, as my old scripts collected a lot more details about the battery. The scripts are merged into the upstream battery-stats git repository already, but I am not convinced they work yet, as I changed a lot of paths along the way. Will have to test a bit more before I make a new release. I will also consider changing the file format slightly, as I suspect the way I combine several values into one field might make it impossible to know the type of the value when using it for processing and graphing. If you would like I would like to keep an close eye on your laptop battery, check out the battery-stats package in Debian and on github. I would love some help to improve the system further.